With temperatures close to 60 and sunny, and with an actual hour for lunch, going for a ride was a no-brainer. I rode from Grover down to Casa Lopez. I was tempted to extend the round trip by two miles by going to Holzer and back, but I’m glad I didn’t. The ride down to Casa Lopez was fast and I felt like I was flying. After a quick swig of water, I turned around and headed back, only to find myself facing a massive headwind. No wonder I was hauling earlier. On the way back, it was all I could do to roll at 10-12 miles an hour, and I bet at times I dipped into the single digits. 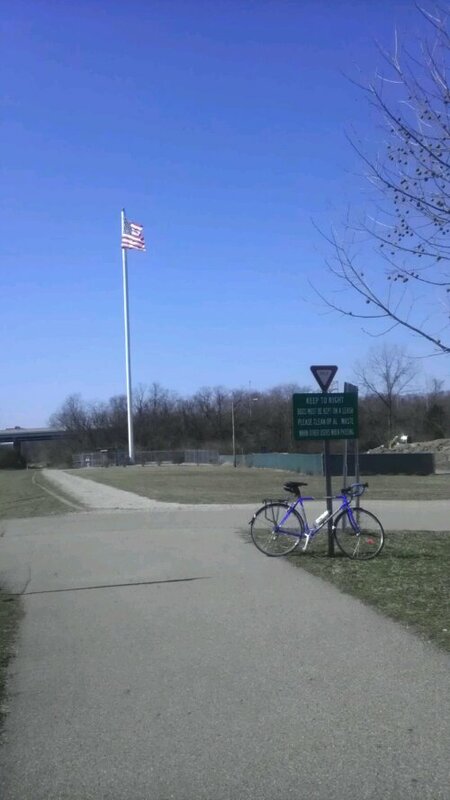 The picture of the flag doesn’t really do the wind justice, as it was really whipping around today. While only a brief 34 minutes on the bike, it felt great. An yes, that makes two days in a row on the bike! This entry was posted in road rides and tagged lunchtime rides by Chad. Bookmark the permalink.